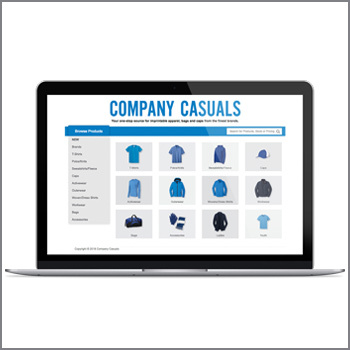 With CompanyCasuals.com and CompanyCasuals2.com—the generic, end-user-friendly versions of SanMar.com—you can give your customers seamless access to our entire product catalog directly from your own website. Now your customers can have the same great browsing experience you enjoy on SanMar.com. The generic Company Casuals sites come in an unpriced version and a priced (MSRP) version. Just like our generic catalogs, the generic Company Casuals sites are an easy way to give your customers access to SanMar's entire catalog without any of SanMar's branding. Using a generic Company Casuals website is easy: simply copy the URL from the chosen version of the generic site and paste it as a link into your own website. e-commerce site, visit our Custom Websites page. Need help? Call our Customer Tech Support at (800) 426-6399, ext. 4830, 6 a.m.-5 p.m. PT, Monday through Friday.